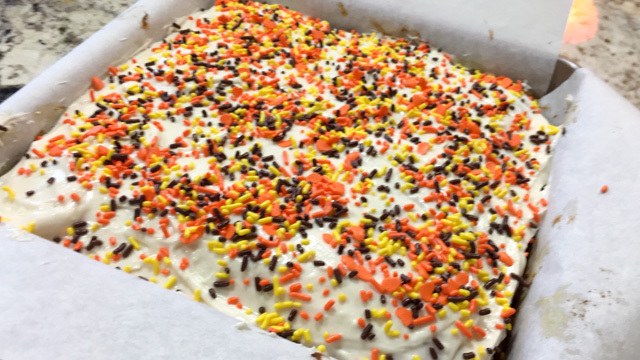 It’s that time of the year, everything pumpkin showing up to say hello… I shall add my humble contribution to the party with this batch of delicious brownies that I made for our department a few weeks ago. The original recipe called them bars but in my mind, brownies fit them quite well. They are moist, sweet, with all the mandatory spices that warm your body from the inside. Perfect with a cup of coffee or tea. Perfect as a little pick me up mid-morning. A shower of colorful sprinkles is optional. I found the recipe through a google search in the blog Sugar Apron. Such a cute name! Heat oven to 350°F. Line a 9×9 inch pan with parchment paper and spray lightly with non-stick cooking spray. Set aside. In a large bowl whisk together flour, sugar, ground ginger, baking soda, baking powder, salt, ground cloves and cinnamon. Create a well in the center of the dry ingredients. In the bowl of a stand mixer combine the eggs, vanilla, oil and pumpkin on medium speed until light and fluffy. Pour in the center of the dry ingredients, then stir gently, just until combined. Ladle the mixture into the prepared pan and bake for 30-35 minutes or until a toothpick inserted comes out clean. Transfer to a wire rack and allow to cool completely. When completely cooled, frost. Make the frosting by combining the cream cheese and butter in a medium bowl beating an electric mixer until smooth. Add the sugar and mix at low-speed until combined. Stir in the vanilla and mix again. You may need to add a little milk to make it spreadable if your butter wasn’t soft enough. Spread frosting evenly on top of cake, add sprinkles if you like. Cut the brownies into any size you like. Comments: These were another huge hit with our department, judging from the enthusiastic feedback and how fast they disappeared from the mail room. I of course loved them, with all those spices it could not be different. If you have homemade pumpkin puree, use it. I recently learned that most canned pumpkin products are actually made from types of squash. It doesn’t bother me at all, but if you are a serious pumpkin purist, consider making the veggie mash from scratch. The frosting was a lot of fun to make, I did not need to include milk. It doesn’t get hard, so I kept the whole pan in the fridge overnight, sliced and took to work early next morning. Sprinkles of course make it very festive. My bottle of sprinkles is pretty big, so I need more reasons to use them before we get into the horrific, depressing, devastating, catastrophic dead of winter. These look really good! Great addition to the pumpkin party. I’m sure your department luurved these! They are lucky to have you bringing treats! when the weather turns ugly, better bring some color to the world! Your work colleagues must seriously love you!!!! The early birds get the worm…! Oh Sally those are beautiful. I love the whimsy! I sense you do not like winter;) I love winter…I love starting the gas fireplace (gave up hauling wood years ago) the even warmth it offers, my fluffy dog next to me, a good book to read or movie to watch. Our summers here in the Sacramento Valley are so blasted hot, that I swear my blood boils until just about now. The trees are all ablaze with riotous color, and I get the urge to get to the kitchen and do a little baking. Try to enjoy the winter beauty. I understand, I feel the same way about our hot summers…ugh! 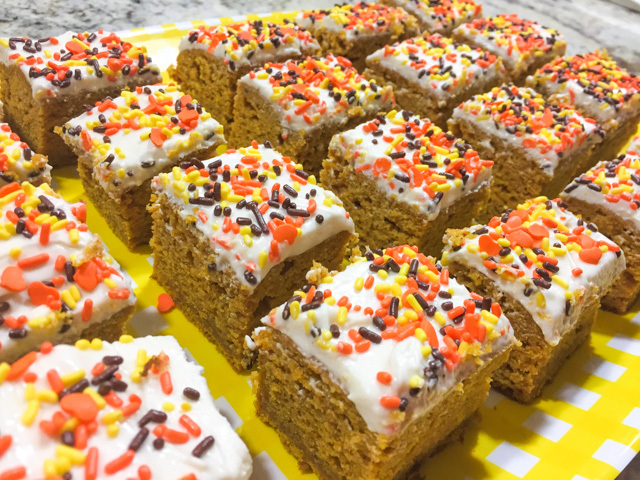 pumpkin brownies! never tried anything like this before. amazing. thank you! Here we go again. I just popped by to copy the Roasted Lemon Vinagrette recipe and here I am lusting after Pumpkin Brownies instead!